Changing your auto insurance policy before it expires, can cause some confusion and anxiety. There are several things you need to consider before switching. This includes determining the best date to terminate your policy, so you don’t have major lapses in coverage. Also, you need to see whether your insurer will charge you a cancellation fee. The amount of this penalty is important because if it is too high, it might make more financial sense to wait to tell your policy expires before getting a new one. If there is no penalty, then it might make sense to switch right away. If you do, there might be a period of time where you have overlap car insurance policies. This just means that your automobile is covered by two insurers at the same time, thus resulting in overlapping coverage. A policy that overlaps can be for as short as 1 or 2 days and in some cases up to a month, or even longer. It obviously doesn’t make sense to have your ride insured twice, so try to avoid this if you can. Get cheaper rates in 2 minutes with a quick quote from good to go insurance online. When you apply for auto insurance quotes, you need to keep in mind that the rates are not in force until you get an effective date for your coverage to commence. This can only be done after you have successfully made a payment. With the internet making purchasing a policy as fast and easy as a few clicks, many people buy a new policy without even thinking about canceling their old one. This can result in an overlap vehicle insurance policy. This essentially means that you are paying two insurers for covering the same car at the same time. If it’s just a couple of days then it might make sense, but not for too much longer. Some people mistakenly believe that if their vehicle is insured twice that they will have double the coverage. This is just not true. For example, if you crash your car and need to file a claim, you can only do so with one carrier. If you file dual claims for the same incident, you are breaking the law. When you buy a new auto insurance plan, make sure you read all the fine print and determine what the rules are about double coverage. You may get your auto insurance canceled if you violate them. It is also important to note that some people get new vehicle insurance and then do not pay their last insurers leftover premium bill. This can result in damaging your credit and higher auto insurance rates going forward. Here are some common scenarios where double insurance coverage can occur. The most frequent reason people end up with overlap auto insurance is they decide to buy a new policy and then wait to cancel their existing one. Some people still have months remaining that they’ve already paid for but don’t make the effort to call their old insurer and cancel. Some people just feel guilty calling and canceling. This should not be the case. Large automobile insurance providers deal with hundreds and even thousands of cancellations daily. Canceling your old coverage should be a top priority if your new policy is in force. Not only will you get a refund but will stay within the law. Another concern is some policies might automatically renew, or your credit cards might be automatically charged. Put in a policy cancellation request with your old provider as soon as your new coverage is secured. Some automobile dealerships will give you car insurance for a set period of time when you purchase a new or used vehicle. This is done as an incentive to close more sales and avoid extra roadblocks to the purchase. If your newly purchased car is covered by a dealer, check when the coverage will expire and plan on getting insured a day or two beforehand. It should also be noted that the dealership’s insurer will want to keep you as a customer, but often you can get lower rates. Make sure you are not set-up for automatic re-billing from the dealers’ insurance company. When a couple gets married they will most likely have two different insurance policies. It makes sense to save money by combining coverage with one insurer. This can be done by simply comparing rates for multi vehicles at leading sites like goodtogoinsurance. Once you find the right plan at the best price, you can then buy the policy and of course, cancel your old one. In some USA states, overlapping auto insurance is legal, but can cause issues that can be a real headache. One of the worst case situations with stacking insurance policies is having your claim denied. If you get into a wreck with a car that has double insurance and file a claim, there is a high probability both companies will find out about the dual coverage. Since auto providers make money by not paying claims, it is in their best interest to find a way to reject a claim that is made. They will point to the other insurer’s coverage and not take financial responsibility for paying it. This is why it is so important to cancel your existing insurance as soon as you get a new policy. Another frustrating thing that can happen when you file a claim when your car is covered by two insurers is lengthy delays. A claim process normally takes a long time and comes with a lot of paperwork. When you have double auto insurance, this process can slow down to a crawl. It can take months to get your claim payout, or you might not get paid at all. 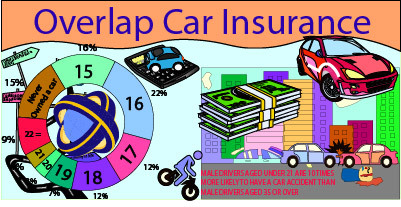 Now that you are familiar with overlap car insurance, how about checking rates online? Get your free no obligation quote in about 5 minutes at good to go auto insurance online. You can save hundreds and build a plan that best serves your needs. Get started today and save more with direct auto insurance prices.